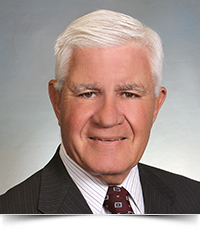 George J. D’Ambrosio, Of Counsel in the Firm’s West Chester Office, has more than 45 years of experience in offering a wide range of legal services, including complex commercial litigation, personal injury, franchise, real estate and municipal law. He started his legal career with the Philadelphia District Attorney’s Office, where he successfully prosecuted over 60 homicide cases. Throughout his career, Mr. D’Ambrosio has represented clients in the purchase and sale of franchises, has counseled clients in corporate transactions, and has extensive experience offering estate planning, estate and trusts administration and probate services. For over 30 years, he was a Partner in the firm of Owens, D’Ambrosio & Nescio. He has served on the Board of Supervisors for West Whiteland Township, Chester County, PA, and taught business law at Immaculata University.